If you are looking for a sporty vehicle that comes with plenty of great features and power but still won't break the bank, then look no further than the Toyota 86. 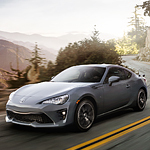 This model is redesigned from the original Scion FR-S model but with plenty of updates. You will find the overall theme of the vehicle is sporty but with plenty of comfort and options available. The infotainment system that is centrally located on the 86's dash allows you to utilize all of your great features like Bluetooth connectivity, navigation, audio, etc. There are a lot of small features packed into the vehicle like cup holders, control knobs and more. Everything is very simple to use and very compact while still providing plenty of space for you as the driver and your passengers as well. Stop down to Nelson Toyota to check out the Toyota 86 for yourself and see what it has to offer.